The ability of the immune system to respond to an antigen exists before it ever encounters that antigen. The specificity of both BCRs and TCRs; that is, the epitope to which a given receptor can bind, is created by a remarkable genetic mechanism. how the diversity of BCRs and TCRs is created. Some experiments supporting the principles of clonal selection. Each receptor is created even though the epitope it recognizes may never have been present in the body. If an antigen with that epitope should enter the body, those few lymphocytes able to bind to it will do so. If they also receive a second co-stimulatory signal, they may leave G0 of the cell cycle and begin repeated rounds of mitosis (the cells are now called lymphoblasts). In this way, clones of antigen-specific lymphocytes (B and T) develop providing the basis of the immune response. The drawing illustrates the activation of the one B cell in a pool of B cells whose BCR is specific for an epitope (small dark spheres) on the antigen. This phenomenon is called clonal selection because it is antigen that selects particular lymphocytes for clonal expansion. a pool of antibody-secreting plasma cells. Plasma cells are B-cells that have tooled up (e.g., forming a large endoplasmic reticulum) for massive synthesis and secretion of an antibody. The antibody is the secreted version of the BCR. (For clarity, each BCR is shown with a single binding site for the epitope; actually, the BCRs are IgM and each has 10 identical binding sites. a pool of "memory" cells. These are B lymphocytes with receptors of the same specificity as those on the original activated B cell. What is the probability that those few lymphocytes able to bind to a particular epitope will actually encounter the antigen carrying that epitope? Surprisingly, it is quite high because both B cells and T cells migrate in and out of lymph nodes and the spleen. Lymph nodes serve as lymph filters, trapping foreign matter that gains access to the tissues. (It has been shown that as much as 99% of the bacteria entering a node are removed by it.) Similarly, the spleen traps antigens that gain access to the blood. process the antigen and "present" it to T cells (Details) and also B cells [Further Discussion]. Lymph nodes, like any other tissue, receive a blood supply. When dendritic cells and lymphocytes find themselves in a venule draining the capillaries of a lymph node (called a postcapillary venule), they migrate through the wall of the venule and take up temporary residence in the node. The unceasing traffic of dendritic cells into, and B and T cells in and out of, lymph nodes increases the probability that when an antigen enters the body, the appropriate B and T cells will encounter it. After recovering from an infection, the concentration of antibodies against the infectious agent gradually declines over the ensuing weeks, months, or even years. A time may come when antibodies against that agent can no longer be detected. Nevertheless, the individual often is still protected against a second case of the disease; that is, the person is still immune. In fact, a second exposure to the agent usually calls forth a more rapid and larger response to the antigen. This is called the secondary response. The graphs demonstrate the main features of the secondary antibody response. A second injection of antigen A produces a secondary response. But the response is specific — not simply the result of a general enhancement of the immune system — because the simultaneous injection of a new antigen (B) produces only a primary response to it. The secondary response reflects a larger number of antigen-specific cells — called memory cells — than existed before the primary response. During the initial expansion of clones, some of the progeny cells neither went on dividing nor developed into plasma cells. Instead, they reverted to small lymphocytes bearing the same BCR on their surface that their ancestors had. [look back at figure] This lays the foundation for a more rapid and massive response the next time the antigen enters the body. To provide long-lasting immunity, memory cells must have long life spans if we assume that they never divide again unless they encounter the appropriate antigen. Some of the lymphocytes that circulate from lymph nodes to blood and back again do appear to be long-lived. In fact, there is evidence in humans that some small lymphocytes survive at least 20 years; perhaps for life. Cell-mediated immune responses also display memory and an equivalent to the secondary response. Graft rejection is a form of cell-mediated immunity. If a piece of skin from a mouse of one strain (B) is grafted onto the flank of a mouse of a second strain (A), the graft does well at first. Blood vessels from the host grow into it, and it functions normally. After some 10–14 days, however, the blood supply to the graft breaks down and the graft degenerates. Finally it is sloughed off like an old scab. This is called a first-set rejection. The graft of C skin is rejected in the normal "first-set" period. 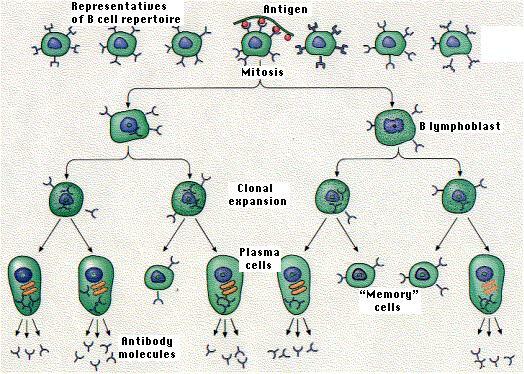 Immunological memory provides the basis for the use of vaccines. These are preparations of infectious or toxic agents that have been altered so as not to cause disease. The alteration is not, however, so drastic as to destroy all the epitopes. The antibodies (and/or T cells) produced in response to the vaccine will also protect against the unaltered disease-producing agent. Link to a discussion of vaccines.